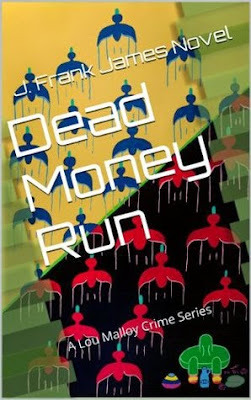 J. Frank James, an American author, has penned his debut novel, Dead Money Run which centers around a brother trying to find his sister's killers after a hell lot of jail time due to stealing millions of money. Moreover, this is the first book in the Lou Malloy Crime series. Lou Malloy served his 15 year jail time for stealing $15 million from an Indian casino, but just before his release, he learns that his only sister has been murdered. He pairs up with the private detective, Hillary to find his sister's killers, but unfortunately he gets dragged into a messy puddle of crimes and strangely he becomes the most-wanted man in the country. The writing is really good and the book has lot of adrenaline rushing moments that kept me on the edges, and I loved how skillfully the author have pulled off those power-packed action scenes. The flow of the book is free-flowing, thus giving a fast pace to the book. The narration is really beautiful and the author have managed to keep it full-of-suspense. There are not much twists in this book as the story flows with Lou's perception and his journey of finding the killers. The character of Lou is not that impressive, in fact his rash and irrational decisions made me dislike him and at times, I failed to contemplate with his actions, well, on the other hand, I fell for Hillary, an understanding, strong and determined lady and her powerful demeanor fits her bill as a private detective. The author is quite keen to tiniest of details, thus it helped me to see the images quite vividly. In fact the author have also give a huge amount of depth to his storyline, that kept me engaged to the core of the story. Overall, the storyline is very interesting and compelling enough to keep anyone glued to till the very last page, and the author's easy and simple language makes it more easier for us to enjoy the mysterious and action-packed roller-coaster ride. Verdict: Recommended to all the psychological thriller fans. Courtesy: Thanks tot he Book Publicity Services for giving me an opportunity to read and review this book. J. Frank James is the author of crime thriller novels. His crime fiction books are gripping and suspenseful with readers being unable to put them down once they get into them. Jim has a passion for writing, and he certainly has the knowledge and experience to write realistic crime thriller novels, thanks to his extensive background in law. Jim attended law school, where he was a member of the law review. He even went on to pass the state bar and started his own law practice that specialized in complex litigation. Jim’s experience in law helps lend credibility to his crime fiction books. Not only that, Jim has traveled extensively and gains inspiration for his crime thriller novels from his travels. Some of the countries that Jim has visited include Peru, Brazil, Italy, Greece and countless others. From observing other cultures and gaining new experiences, Jim is able to infuse new life into his books and develop believable characters that readers can identify with. At present, Jim has published four crime thriller novels. All four of his novels have the elements necessary of good crime novels that keep readers glued to the pages from start to finish. Although Jim’s crime novels are fiction works, they are exciting to read because of their authentic nature. They are written with the backing of Jim’s experience in law, so they are believable situations that have the readers wanting to find out what happens next just like they would in any crime situation. They offer the readers just enough information to keep them guessing and trying to solve the crimes until the end of the books when they are actually revealed. Jim’s books are also fresh and unique takes on crime as well, though. They are not the same whodunit type books that have been done over and over again. By infusing his personal travels into his books, Jim creates characters and atmospheres based on just enough truth to be relatable. Plus, Jim’s books have everything in them from robbery to prison to family. They have hard and soft elements simultaneously to really capture the life of a hardened criminal who is still very human and struggles with the same human emotions as the rest of society. At the same time, Jim gives the reader perspectives from private investigators to balance out the story. Jim’s books even have a hit of romance when his characters come to care for each other as more than just friends. Then, crime and love mixes to create a dynamic atmosphere that is even more complicated than ever before since characters care not only for each other but for their other family members as well. Jim has an amazing way of incorporating various elements into his latest crime novels to create thrillers that readers cannot get enough of, which is perhaps why all four of his books so far carry on one from the other to continue the same story concerning the hardened criminal who did 15 years in prison, Lou Malloy and who comes to be his partner, private investigator, Hilary Kelly. The two of them go it together to create gripping stories that keep readers coming back for more. Now it's your turn to win a kindle copy of Dead Money Run just by entering the rafflecopter giveaway. Good Luck! I love the storyline of this novel and would love to read it.